The girls of the Roanoke family - beautiful, rich, mysterious - seem to have it all. But there's a dark truth about them that's never spoken. Either the girls run away...or they die. Lane is one of the lucky ones. When she was 15, over one long, hot summer at her grandparents' estate in rural Kansas, she found out what it really means to be a Roanoke girl. Lane ran, far and fast. Until eleven years later, when her cousin Allegra goes missing - and Lane has no choice but to go back. She is a Roanoke girl. Is she strong enough to escape a second time? The novel centre's around the Roanoke family with Yates at the head of a plethora of beautiful girls, from his sisters to his daughters and granddaughters, all the Roanoke women have the same striking beauty in common but they all also all have a tragic life already mapped out for them. They will either run away or die. But why does this keep happening to the girls of the Roanoke family? When Lane Roanoke moves in with the grandparent's she's never met she's about to find out why her mum was so depressed so eventually killed herself, why her cousin Allegra is so erratic with her behaviour, why her grandmother seems to hate her and most importantly she's going to discover what really goes on at Roanoke. 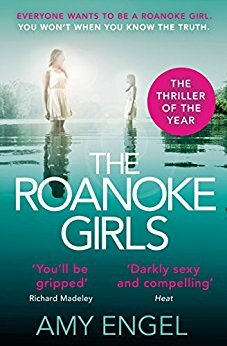 Although a dark and disturbing tale of abuse, I really enjoyed (if that's the right term) reading The Roanoke Girls. It was a well crafted tale of what goes on behind the doors of a rich family's home, that both shocked and gripped me. Each Roanoke girls story was carefully thought out and woven into each other and the modern day tale of Lane and Allegra. The split mystery of figuring out what goes on at Roanoke (although that wasn't too difficult to work out) and what happened to Allegra is an aspect of the novel that I really liked. I would have liked to have seen the girls of Roanoke wield a bit more power in the end rather than the whole novel been focused on the patriarchal power of Yates and his wife's reluctance to protect her children but I understand that it was also trying to look and the damaging effects of abuse. Overall The Roanoke girls was a quick, gripping read that I'd recommend giving a go.